If you are married, the chances are you are married to somebody quite like you, especially in terms of social class and education. This tendency has earned the unromantic label “assortative mating” in social science. The discussion centered on the way in which assortative mating contributes to income inequality. The research on this question does not provide a definitive answer. It looks in fact as though the rise in single-parent households has had the biggest impact on income inequality. In other words, any effects on inequality from the growing tendency of people to marry people like themselves is dwarfed by the effects of people not being married at all. (Mea culpa: I didn’t get this nuance right in the interview.) 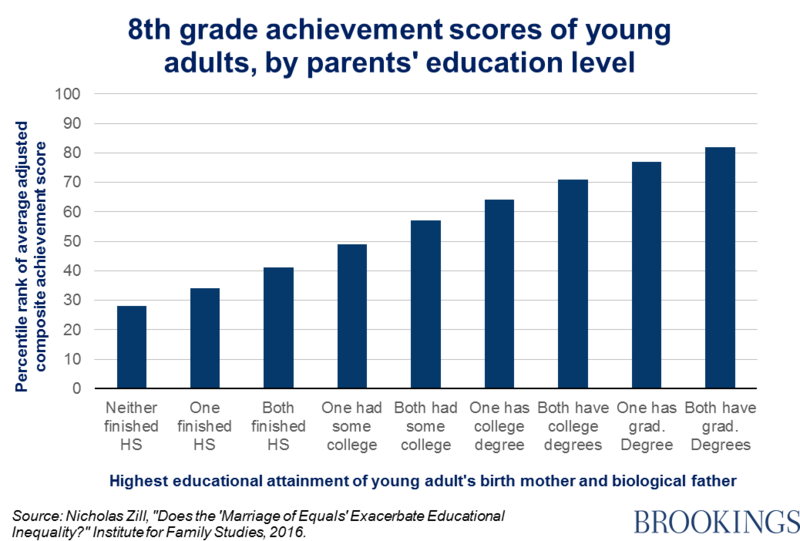 In practice, the two trends are likely to reinforce each other, since better-educated Americans are also more likely to stay married. It helps a lot if one of your parents has a good education. It helps even more if they both do. This is not surprising, and surely reflects a complex mix of economic, genetic, and social factors. It is important to keep a sharp distinction here between description and prescription. The trends being described are the result of millions of private decisions, and of broader social and cultural changes in the roles and life chances of women and men, the function of marriage, the nature of courtship and mating (especially in an era of online dating), and so on. Nobody wants a National Marriage Agency choosing our partners for us according to an egalitarian algorithm. But we should be attentive to the dangers of class segregation more generally. Assortative mating may be a symptom of the greater separation of neighborhoods, occupations, educational institutions, and communities. It is also important to remember that while adults choose their partners, children do not choose their parents. Overlapping inequalities in income and wealth, family stability, and education are driving in a large, and growing, opportunity gap. Narrowing that divide is an important goal for public policy.